Wesley Clark, Jiří Dienstbier and Andrés Pastrana all have shown a dedication to public service throughout their lives. Their commitment and achievements have been honored today with the Hanno R. Ellenbogen Citizenship Award. Pavol Paška, speaker of the Slovak National Council and patron of this year’s event handed the award to Wesley Clark and Andrés Pastrana today. Jiří Dienstbier received the award posthumousely. 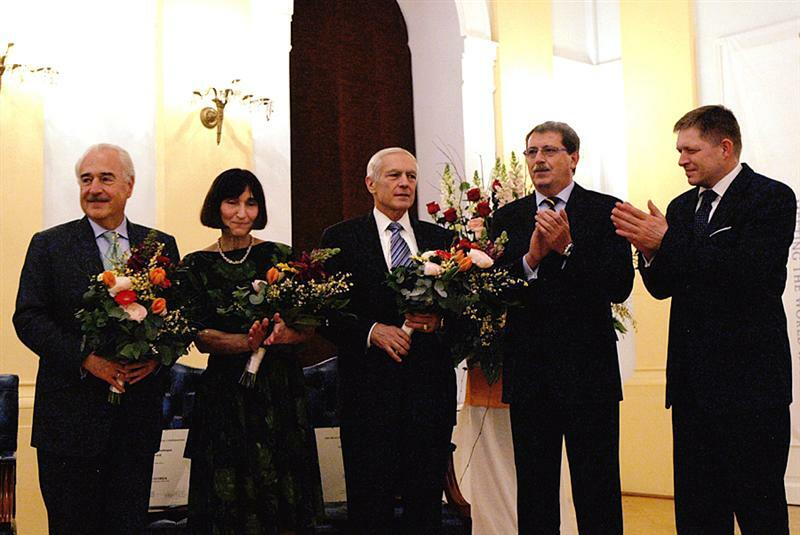 The ceremony took place at the Parliament of Slovakia in Bratislava. The HRE award was established in 2000 to annually honor people who have dedicated their lives to public service. The award is named in honor of the life and work of Mrs. Hanno R. Ellenbogen, the Global Panel’s president’s mother. Mrs. Ellenbogen, who died of cancer in 1997, provided a remarkable example of a life lived in commitment to ideals of public service and the common good that cross national boundaries. The years spent with a family in the heart of a divided Germany and a divided Europe instilled in her a firm belief in the need to take positive action to break down the barriers which divide people in their shared destiny. Among the laureates are former Czech President Vaclav Havel, the current Dalai Lama and the former US Secretary of State Madeleine Albright.